First off I've got to say that I love Larissa Ione's books, every one I've read has been really good if not great. I'm so excited for this series because Bound by Night is a really good start with fabulous world building. It is hard in the world of PNR to find something really different and Ione is really good at coming up with something unique. And this story is not like anything else I've read. 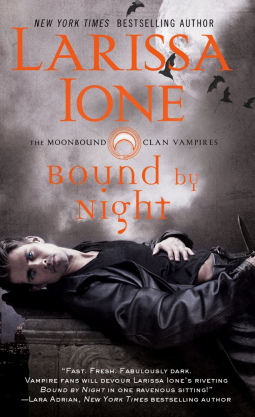 In Bound by Night vampires have been made into slaves who serve humans and have little to no personal rights. Riker is a member of one of the free vampire clans that are hiding out while fighting back. It's easy to feel for the vampires and their plight in this dark, bleak world. Nicole is on the other side in the beginning, coming from a family that has made its money from these slaves. After her family was slaughtered in a vampire uprising she's left terrified of them. Both characters were interesting and the side characters were equally captivating. I'm actually looking forward to seeing some of them get their own books. The story was really good, with only a few minor things I didn't like. The main problem I had with the book is that Nicole seems to fall for Riker so quickly. It should have taken her a while to come to terms with her fear of vampires after living with the anxiety her whole life, but shortly after Riker kidnaps her she begins to want him. I do get it though, they sort of have some history, and it didn't however stop me from really liking the book, but the beginning was a little crazy. It is an excellent start to the series though and I'm dying to read the second book, Chained by Night! What do you think of the cover for Chained by Night? Le sigh, the prickly insta-love. I loved this series though, I love the sci-fi twist on vamps and the whole "vampire tribe" going on. This is how TB should've done it instead of that mess they did with the story.